Proud of our role in the new American economy. Ready to seize the opportunity, invest and be part of America's tech job growth. I am proud of the investment in innovation that we are making in the United States. By the end of 2020, we will open 10 new innovation hubs in key cities and expand our regional network of technology delivery centers across the US. Equally exciting is our $1.4 billion investment in training to ensure Accenture people continue to have leading-edge capabilities to serve our clients, and even more opportunities to participate in one of the most dynamic parts of the American economy. In this same timeframe, we will also create 15,000 highly skilled new jobs in the US. By the end of 2018, we will expand our national program to grow to more than 100 apprentices, building upon our success in Chicago and San Antonio. We are creating new jobs across all of our businesses—Strategy, Consulting, Digital, Technology and Operations. We're seeking talented professionals in a broad range of disciplines, including engineering, computer science, analytics, digital, design, cloud, security and other new economy skills at all career levels. Our recruitment plans will continue to reflect our unwavering commitment to inclusion and diversity. The need for innovation to grow, compete and transform in the digital economy has never been greater. And Accenture is ready to play an even bigger part in the nation's job growth and innovation agenda. Julie Sweet joins a Milken Global Conference discussion on innovation and US competitiveness. Accenture has teamed up with Columbus State Community College to recruit students and recent graduates to participate in its year-long apprenticeship program, where they will be part of its Columbus innovation hub team. Accenture Expands Innovation Hub in Metro Washington, D.C. with Launch of New Cyber Fusion Center. The expanded Metro D.C. innovation hub helps clients defend against cyber attacks through an Accenture Security Cyber Fusion Center, Accenture Labs and Fjord Studio, to bring together capabilities needed to protect and build trust in the digital economy. The new Metro Detroit innovation hub will add 200 highly skilled tech jobs to the local market and will be part of Accenture's national apprenticeship expansion. Columbus Innovation Hub will add 200 jobs to the city's tech community, and help clients modernize legacy applications and take advantage of the latest IT techniques. By the end of 2020, Accenture will add 400 technology jobs in Minneapolis, growing its workforce in the market by 25 percent. Boston Innovation Hub will help clients grow, compete and transform in the digital economy. In order to serve clients, Accenture will add 400 skilled technology jobs by the end of 2020. Julie Sweet, Accenture’s North American CEO talks about the 3 A's that her clients need to focus on: Artificial intelligence, Analytics and Automation. New York City Innovation Hub to serve as destination for clients and Accenture people to co-create industry solutions for the digital economy. Julie Sweet, Accenture CEO – North America discusses the company’s investment in innovation, the business leadership community and importance of STEM education. Accenture North America CEO Julie Sweet talks with Yahoo Finance’s Rick Newman about the changing workforce and why it’s important for companies to adapt. Julie Sweet, Accenture CEO – North America, says that the unprecedented change brought about by the digital revolution is challenging business leaders to prioritize a new set of goals. 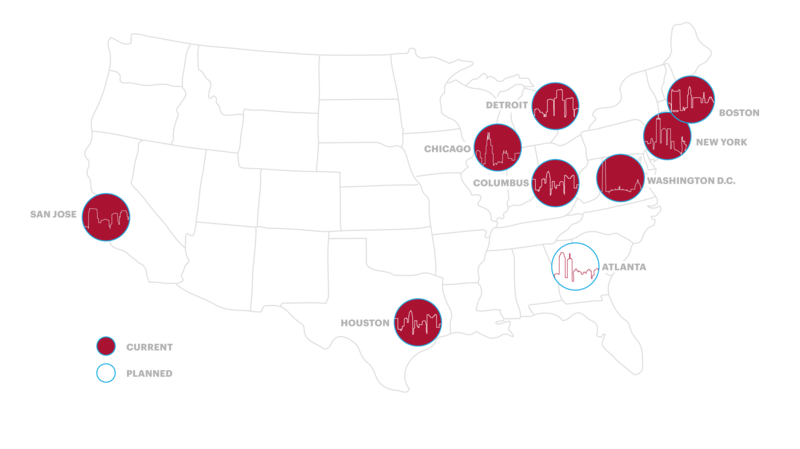 Accenture is Accelerating Innovation Investment in the U.S.
By the end of 2020, Accenture will open 10 new innovation hubs in key cities in the U.S. and expand its regional network of technology delivery centers. Located in the heart of Houston’s business district, the innovation hub includes a liquid studio and innovation center. Accenture, the Swiss-American Chamber of Commerce, the Global Apprenticeship Network (GAN) and ETH Zurich/KOF Swiss Economic Institute released a new report that examines best practices for creating and sustaining apprenticeship programs. Accenture announces that it will expand its Chicago apprenticeship program modeled on Aon PLC’s highly successful program run in collaboration with the City Colleges of Chicago. Accenture Federal Services launched an innovative public-private partnership with the City of San Antonio and Bexar County, Texas to provide up to 50 paid apprenticeships this year. Learn more about the Accenture Innovation Architecture. Of all of our accomplishments, we take pride in greater performance, diversity, and innovation. We’re honored to be recognized for our success as we continue our journey. At Accenture, our commitment to diversity and inclusion in the workplace starts at the top. Learn how this helps us be stronger, smarter and more innovative. On Veterans Day—and every day—we #ThankItForward to Service Members, Veterans and Veterans organizations. The diversity of our people is part of what makes Accenture exceptional.